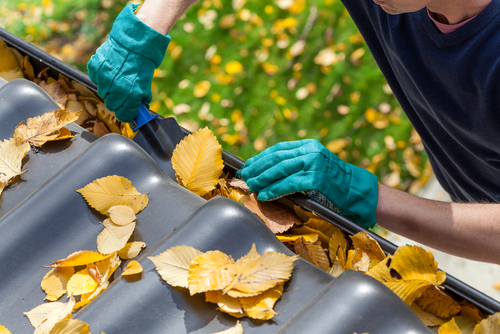 Have you cleaned your gutters this season? If not, you may want to consider doing so now. The experts at Blue Springs Siding & Windows recommend thoroughly cleaning your gutters every spring and fall, to keep them working like they should, and to prevent further damage to your home like water damage, loose gutters, ice dams and even vermin. Water damage: Cleaning your gutters regularly can help prevent buildup and clogs that can cause water damage to your roof. Properly functioning gutters will also direct water away from your home, preventing water from seeping into your home’s foundation, basement or crawlspace. Loose gutters: The weight of water, leaves and other debris can loosen your gutter and cause them to pull away from your home, that could eventually lead to replacing the gutters. Ice dams: Living in Kansas City, we’re all too familiar with the freezing weather that comes during the winter time. Ice dams form when water flows over the edges of a clogged gutter and then freezes, forcing water into your home. They can become so heavy the gutter can rip right off your home, often resulting in costly repairs. Vermin: Clogged gutters can be inviting to all types of bugs, including carpenter ants, mosquitos and even rodents. If you have pests living in your gutters, chances are they could be living in your home. Questions about your gutters? Call Blue Springs Siding & Windows today at (816) 944-3156 and we’ll be happy to help!